In my Hamstreet 10k report, I explained the careful thought and planning that goes into my decision about whether or not to do a race. With hindsight, I have realised that this is not entirely true. Sometimes I get giddy and enter a race without considering ANYTHING. 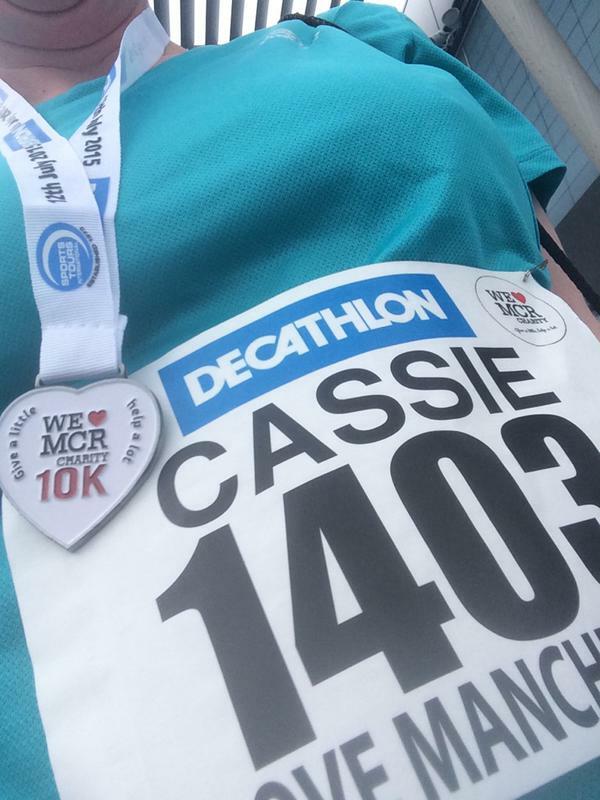 The We ♥ Manchester 10K was one such race. I knew that Ginge was working (removing both support crew and childcare) but I signed up anyway. I also failed to take into consideration that it is actually easier to build your own sedan chair and convince some strapping young men to carry you the 25 miles to Manchester than it is to get the train on the weekend. Now, Ginge is always incredibly supportive of my running (and I don’t give him enough credit for that in public) but it’s fair to say that I would not have been able to run today without him. Mini-Ginge was presented to his grandparents at an ungodly hour of the morning and I cadged a lift into work with Ginge (who conveniently works a five minute walk from the race), was given a security pass and hung out in their staffroom for an hour and a half before being walked off site and sent on my way to the startline. My first impression of the race was via the toilets – this is a hugely important part of race day in my opinion. Using the loos on the Etihad Stadium concourse there wasn’t much of a queue and staff were keeping an eye out to make sure that there was enough paper in each cubicle. This was a thing of brilliance. Kudos too, to the chap who blindly joined the queue for the ladies (obviously in raceday = unisex portaloos mode) only to have it gently pointed out that there was a massive drawing of a person wearing a dress on the wall. There was a pre-race warm up, but the outdoor PA system wasn’t brilliant and I managed to ignore any excess exercise and enforced jollity. Instead I entertained myself by people watching (there were a couple of very touching goodbye kisses that had my bottom lip wobbling) and trying to work out where I should lurk in the pack. I normally skulk at the back trying to surround myself with the aged (doesn’t always work, I often get my arse kicked by pensioners) and the infirm (two knee braces? I’m right there alongside you), but everyone looked very perky and athletic where I was, which did unnerve me slightly. Right. Race plan. I felt that I should have some kind of plan, but couldn’t decide what to do. On the one hand, I wanted to stalk the hour pacer (even though this was completely unrealistic) and on the other hand, I thought about treating this like a long, slow run. I ummed, I ahhed, I set off and just ran. Round the track, out of the athletics stadium, past the Etihad and into…well, mostly industrial estates and housing. This was not a scenic run by any stretch of the imagination. This isn’t a criticism though, I really enjoyed the race. It was run on closed roads, meaning no hopping on and off pavements (I’m really nervous of this since my fall), it was well marshalled (including the most fabulous marshall just before 7k who was telling us all that we were AMAZING) and all the facilities were excellent (I’m gutted that I didn’t have cash on me to buy cakes in the marketplace). The route looped round and back on itself a bit, which meant that between 7 and 8K, you were taken tantalisingly close to the finish. At first, I thought that I had missed a turning and accidentally lost a couple of kilometers, but soon realised that no, we had to run past the people finishing and keep going. Which is when I had my favourite part of the race. At around 8K, I had given in to my nagging negative head and had started to have a bit of a walk when I was passed by a woman who yelled at me “Come on, you’ve been ahead of me all the way round, you can’t walk now”. Now you can’t turn down a challenge like that, so I picked it back up again, knocking about 30 seconds off my minute/mile pace. And then I walked again, but sure enough, along came Rachel to shout at me that I’d done it again. So I picked up the pace and had a nice chat as we ran the last 2k together. The whole thing made me marvel that (a) a stranger can make so much difference and (b) that someone had been clocking me during a race. Whilst I know that I spot people and keep an eye on them for their pace (or occasionally to try and overtake them) I never once imagined that someone else would do the same to me. So a huge thank you goes out to Ginge (without him, I wouldn’t have even reached the start line) and Rachel (without her, I would have been much slower in crossing the finish). Today’s race was 10 minutes faster than my last (hilly) 10k AND I have since realised that it was about 7 minutes faster than a flat road 10k that I ran last September, so I must be doing something right.